After my wife had returned home we expected a police raid or something, but nothing happened. Immediately, my wife was on the phone, trying to connect with her new employer, which she so prudently had found well beforehand, and now she was imploring them to help us. We did not have enough cash for even one plane ticket, and we needed two. Fortunately, the employer already knew what was happening in Turkey and agreed to advance us the money. Thus our plane tickets were purchased for us immediately. We fled the country the very next evening. The day was spent in crazy packing and preparation. We were leaving nearly everything we had bought in Turkey. Around midnight we stepped out of our apartment for the last time, carrying two suitcases and a couple of bags. I looked back at our temporary home and only shook my head in sad disbelief. It had served us well while it lasted. It was a typical furnished modern apartment in a typical Turkish apartment house, completed with a customary sofa and plump armchairs, a Turkish rug, a dishwasher, a huge bed, and various trinkets. We did not manage to add to its furnishing much — just a few lamps, cookery, and other small things. Still, it used to be our home. The only thing that we carried from the apartment, except for our luggage, was our live Christmas tree that we bought the last Christmas. (I was somewhat surprised that Turkish supermarkets sold Christmas decorations and tiny live Christmas trees planted in soil-filled baskets.). I hated the thought of throwing it away. Therefore, we took it to the lobby and implored a security guard to give it to a maintenance guy in the morning so he would plant it somewhere on the building grounds. The taxi turned around and left without us. We were stunned. What special permit? What was he talking about? My wife was frantic while she continued to ask the security guard the same question again, again and again. He called us another taxi, but this time my wife showed the driver our boarding passes, which she smartly printed a while ago. The driver seemed satisfied this time, and so we got into the taxi and drove off. The ride took us less time than we expected, for it was late and the highway was relatively free from its usual crazy traffic. As we were approaching the airport, the driver grew visibly nervous and angry. In the next few minutes, I understood why. The entire road that led to the departure section was blocked by a shouting crowd of men and hijabed women, nearly every one of them waving the national flag. They surrounded our car immediately, so the driver had to step on the brakes. The men studied us through the windows, and then reluctantly let us proceed. I noticed that every vehicle that approached the airport was given the same treatment. The last trial that we had to endure occurred at the police checkpoint. We both had our Turkish ID and our US passports at ready. The custom officer briefly glanced at mine and waved me in, but he had taken such a long time studying my wife’s ID and passport that we both nearly fainted. The ID had the name of the university where my wife worked. Also, that week a presidential degree required all academic faculty to return to Turkey and prohibited all international travel, including research-related activities. It was not clear whether that degree covered international faculty. He scrutinized it from both sides several times, grunted, looked at my wife, and leafed through the passport at least fifty times. It felt like a slow torture. Finally, he returned the documents to my wife and waved her through. At least, we were within departures territory. 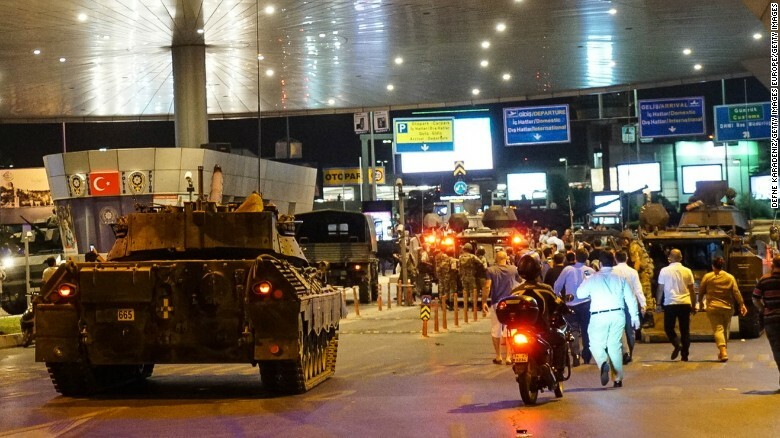 Later, we learned that a large number of the airport customs officers were arrested under a pretext of being clandestine members of the Gulen organization. We are still wondering if that particular custom officer, who handled my wife’s documents, was one of them. Undoubtedly, he scrutinized the ID with its school name with great interest but then he allowed us to go through. Was it a coincidence or a conscious decision on his part? I guess we will never know. As soon as we boarded the plane, I fell asleep and woke up only in Paris. I had not felt so relieved in years. Now, when I look back at it, I think how it all began, so innocently and happy. Precisely one year and a half ago my wife was invited to join a faculty of a certain private university located in Istanbul. It sounded like a good opportunity and so we agreed to relocate to Turkey. The city positively impressed us from the very beginning. Its newer districts looked extremely modern. Besides, it gave off a somewhat surreal feeling, for it is unbelievably huge. In fact, Istanbul is of the size of a small country, and even its diverse transportation, which includes metro lines, trams, buses and private shuttles, is unable to resolve the problem of overcrowded rides, and hours spent on the road and choked highways. Istanbul has two faces; one of them is distinctively European, the other is Asian. The city itself is a home of many different religious communities, the largest of which is, of course, several branches of Muslims; the Christian community is relatively small but, due to the history of the city, it is highly noticeable. One moment you tend to forget that you live in a Muslim country, then suddenly you are being reminded of it. There is, for instance, a visible separation of genders. You notice it right away. It is quite a mysterious thing in itself for we often wondered how on Earth Muslim girls and boys manage to meet and form couples and so on. Nevertheless, they do, for when you go to a shopping mall, you see a lot of young families with children. In any case, the male part of the populace visibly enjoys more respect than the female one. It is a rare occasion when someone yields his place to an elderly woman on a crowded bus, but someone (quite often a woman) always does so for the sake of an elderly (or not so elderly) man. It has often been said that the Muslims, unlike Westerners, hold their elderly in a prodigious respect. Indeed, there is a tradition in Turkey to visit their elderly parents once a year to kiss their hands. But in general, old people are practically invisible. In fact, you do not see them anywhere. The streets are filled with young and middle-aged men who hurry in large groups, or sit in restaurants and cafes drinking their tea. There are a fair number of women on the streets as well, but as the sun goes down, their presence becomes rare. It has also been said that the Muslims are ardent believers. I cannot say anything about that for sure, for nobody had tried to talk to me on that subject, but we did notice that the astonishing multitude of mosques built recently stayed almost empty. Of course, most Turks religiously observe the Ramadan, which from the start and till its ending one month later turns into a marathon of all-night eating. At the beginning of the holiday, restaurants and cafes stay deserted till sundown, but, as the Ramadan gradually progresses, people start eating openly during the day. The number of shoppers who carry plastic bags laden with food from stores triples. The quantity of leftovers thrown on the ground, especially half-eaten loaves of special Ramadan bread, turns into a carpet. Street dogs, which usually eat any thrown-out food, become choosy. They grow fat and lazy, but it is a sign of the Muslim charity to feed street dogs during the Ramadan, although there is always someone who feeds them during the year. I must say that there is a fearful quantity of stray dogs living on the streets of Istanbul. It is not so apparent in the center, but as you move towards a periphery, you are surprised by their sheer number. They come in all shapes and types, but, despite their monstrous appearance, they are mostly friendly and docile. There are active Christian Churches in Istanbul. It was yet another exciting experience for us to attend an Easter Celebration in the Greek Orthodox Church, when the Patriarch of Constantinople was officiating The church was packed, but what caught my eye were groups of Muslim women, all dressed in black and wearing their hijabs, who came to watch the celebration spectacle. They had their cameras at ready and were filming all the proceedings while laughing merrily at what they probably saw as exotic and hilariously barbaric customs. If you have not previously heard a call for prayer, which is performed five times a day, you might find it slightly shocking. The number of mosques and their attached minarets is astounding. Just a few years ago Istanbul had significantly fewer mosques than it does now. Apparently, one of the President Erdogan’s claims to the eternal glory is building more and more mosques. Nowadays, a mosque can be found in a virtually every city block of the new districts. Despite this abundance of mosques, more mosques are being built, especially in newer parts of the city. It seems that Erdogan has decided to overdo all former sultans who tried to glorify their names and their rule by erecting new mosques in their names or the names of their favorite wives. The President also cares about the overall look of the city: he orders demolition of its old residential districts and erecting in their place ultra-modern glass covered high-rises with attractive penthouses on top or elephantine buildings that house various government Ministries. The imposing facades and overall architecture of the government buildings makes one imagine the Orwellian Ministry of Truth. Istanbul is a modern city; in newer districts people live mainly in high-rise apartment buildings united into enormous complexes, surrounded by high concrete walls with barbed wire on top. There are also unbelievable quantities of Wi-Fi aerial columns; some of them constructed as fake trees. Stores and shopping centers are divided into either traditional or Western. The Europeanized establishments sell alcohol, while the traditional ones do not. In traditional areas, a larger proportion of the female population wears hijabs; Kurdish women are dressed entirely in black. Some women, more Westernized one, wears Western clothes, and many young girls go around with their heads uncovered and even wear short skirts. You could also see guys dressed in shorts and wearing long hair, tattoos, and earrings in the downtown area. It is the world within the world. But there is definitely a trend away from Westernization. Nowadays, women are attacked for wearing shorts or revealing clothes. A woman was kicked in the face for wearing shorts. A month ago there was a fight in one of the downtown pubs —a group of devoted Muslims entered it and started to beat up customers with chairs because the customers dared to drink alcohol during prayer time. I remember a pub where we used to go. I wonder if it is still open, and if it is, how safe its patrons feel. In fact, this aggressive de-Westernization of Istanbul had begun quite recently, roughly a year prior to our arrival. For instance, many restaurants and street cafes across the city used to serve alcohol but now it is prohibited nearly everywhere. During our stay, there were only a few places in the central touristy districts like Kadikoy that still did it. Erdogan, while he was the Prime Minister, introduced new restrictions on sale of alcoholic beverages. For instance, no alcoholic beverages could be sold within a certain distance from either a school or a mosque. Since the number of mosques has grown, there are not many places left to engage in this sinful commerce. Same goes for hijabs, which also suddenly became ‘popular’ three years ago. Nowadays, young and not so young women wear them. Why? The explanation that was given to us by a young female student went like this: “Because I want to look like a respectable woman.” Clearly, the notions of what is respectable and what is not, are changing fast in Turkey, which is not surprising, because in his countless public speeches, the President often waves the Holy Quran, thus reminding his subjects of their glorious Ottoman past and their present sacred duties. The university where my wife worked turned out to be a traditional institution unevenly divided along the traditional and Western lines. Perhaps 90 percent of the female student body was dressed in a strictly traditional way, with covered arms, legs and head. It was the same was with administration and faculty. Even the public facilities were divided by this principle — three traditional cubicles with a hole in the floor and a plastic container for washing, and two cubicles furnished with western toilets. Men and women could enjoy their (segregated, of course) praying rooms. The official school communications were filled with the usual rhetoric regarding intolerance to discrimination on the grounds of nationality, religion and so on. In short, the school positioned itself as a strictly secular institution designed only for learning. She said it with such fervor that for a moment I was sure I had spotted a tear in her eyes. Shortly after that we began to talk about propriety, morals and ethics. (Later, she told my wife that she had started to cover her head less than a year prior to our conversation, when Erdogan issued a special permission. Until then, hijabs were prohibited in public institutions, including universities). I will not go into great details about that trip but will only say a few things that I deemed important. First, the trip included three visits to different mosques. Students were obliged to attend religious services, so my wife and I were forced to loiter outside and wait patiently for the end of the services. The only good thing about it was that we could visit the facilities (for a mosque’s facilities, which are always located within the enclosed grounds but outside of the mosque itself, are widely used by the public as public toilets. Some of them even charge a fee for entrance.) One of the teachers tried to persuade us to accompany them into a mosque and observe the service, but we politely declined the honor. Secondly, the trip itself consisted mostly of visiting historical sites where a customary local guide (who was hired by the school) was lecturing the students on the past glories of the Ottoman Empire. As far as translation allowed us to understand it, these lectures roughly described the good old days, when past Sultans ruled their people with justice and kindness. According to the guide, at the beginning, Turkish sultans were extremely modest folks. Unlike the corrupted Byzantine elite and especially the Byzantine priesthood, they abhorred the luxury of palaces, and they always catered to the needs of their people. It was only later on, when Sultan Mehmet II had had enough of Byzantine scheming’s and their corrupt influence and was literally forced to destroy the whole Byzantine Empire, the new Westernized tradition of luxury, decadence and degradation were introduced to Turkish courts. Since then, things went terribly wrong until the Ottoman Empire, once a glorious and most perfect political machine, fell into shambles. Speaking of corrupted Byzantine influence, it was rather sad to see some former churches of that period turned into mosques. Of course, we kept such sentiments to ourselves. All in all, our impression of these lectures and the whole tour was of blatant nationalistic propaganda poured on the students. Combined with an obligatory attendance to prayer and other small things, it began to worry us a little. It did not look so innocent anymore. In fact, it smacked of pure nationalistic brainwashing, not unlike the very popular historical serial The Magnificent Century based on the life story of Suleiman the Magnificent — the very guy who had tried to overtake Vienna but died on the way back after experiencing tremendous military defeat. The series, which appeared on Turkish television, was so filled with grotesque historical distortions and whitewashing of the former good old days of medieval tyranny that it was simply hilarious. In fact, we couldn’t believe our eyes. I mention this serial only because now I fully realize how typical this creation is in regards to Erdogan’s regime of militant nationalism, totalitarian terror, and traditional Islamic values, even though Erdogan thought its portrayal of the times and people was overly decadent. The second incident that I would like to mention happened some time later when we again were invited to a students outing — a barbecue in the country — organized by the school and of course, supervised by a number of teachers. Already forewarned by the previous experience of endless waiting outside of mosques, we nevertheless agreed, having the idea that in the countryside, there would be no mosques; besides, a barbecue in a country sounded innocent enough. In addition, my wife seemed concerned with yet another strange thing, namely — her students never talked to her outside of class. It was impossible to figure out why they exhibited such behavior. Were they shy? Or was it due to another reason? Perhaps, a barbecue could serve as a nice opportunity to get to know each other. And so we went. The bus transported us, along with a large group of students and several teachers, into a mountainous area, which looked bucolic enough. Then the weird stuff started. One of the teachers announced to us all that we are going for a little country hike at the end of which we will visit a beautiful local waterfall. All the students were herded into one group. Suddenly there appeared a guy who looked exceedingly like a drill sergeant, and pretty soon it became apparent that what we were witnessing was, in fact, paramilitary training: the poor students were told to climb stiff hills, walk over a rough terrain and so forth. It was a surrealistic spectacle in a way, for all the females in the group were dressed according to a strict Islamic tradition. The weather was hot, so all these girls sweated profusely under their hijabs and heavy coats while they climbed hills, crossed fast creeks and so on — bizarre in the extreme. This paramilitary exercise went on for nearly four hours at the end of which we returned to the place where we had initially started our strenuous journey. Several guys attended to preparing barbecue food while all others whipped out their praying mats and performed an afternoon prayer. After that day, my wife and I began to wonder seriously what was the university was really all about. Only weeks later, a departing foreign faculty member told us in private — look, guys, this school is Gulenist. Since then we began learning about the Gulen movement.